The Palestinian call for Boycott, Divestment and Sanctions (BDS) was launched 10 years ago, providing Palestinian leadership and strategic guidance to what had been a disparate set of ad hoc boycott actions around the world. 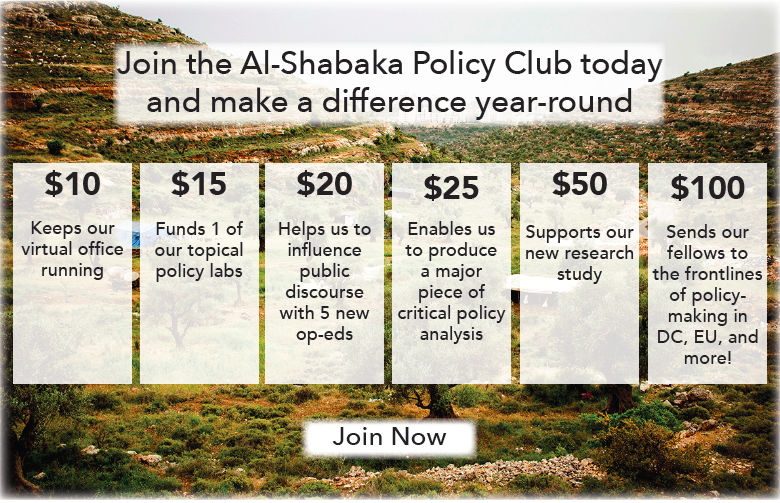 Al-Shabaka takes this occasion to republish Policy Advisor Omar Barghouti’s policy brief, which addresses the basic principles and strategies underpinning the BDS movement that have remained constant since its founding. The brief tackles the reason why the movement has not specified a political outcome; highlights the “unambiguous invitation” to Israelis of conscience to support the Call and the efforts of the Zionist left to undermine it; and points to a key reason for the movement’s success - the freedom to design BDS actions that are context specific, gradual, and sustainable. While BDS opponents accuse the movement of seeking to “destroy Israel” Barghouti makes it clear that the aim is simply to hold Israel accountable to international law, and that Western civil society bears a unique responsibility to do so given Western governments’ complicity in enabling Israel’s rights violations.